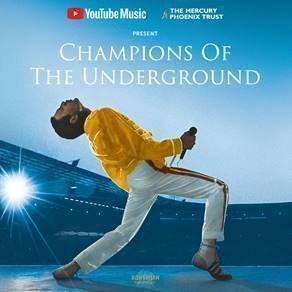 Champions of the Underground: YouTube Music to celebrate the legacy of Queen in the a unique Tube performance site in London on Wednesday 24th October! This is your opportunity to see artists, tribute bands and musicians performing as YouTube Music celebrates the legacy of Queen, to coincide with the UK release of the Bohemian Rhapsody film (24th October). For one day only the takeover of 33 locations on the London Underground – in partnership with Mercury Phoenix Trust, fighting AIDS worldwide, and Transport for London (TfL) – will have artists, tribute bands and musicians performing Queen hits to entertain the public.